SETUAN (Sepatu All in One) is an innovative product which has dual functions, as shoes and slippers. This concept is developed by four UMY students, three of them are from English Language Education Department, Sayyida Ralia, Oktaria Firda, dan Puji Hapsari, and one student from Economic Science Department. Through the use of Luric fabric of Yogyakarta, this product also aims at strengthening people love for local culture. 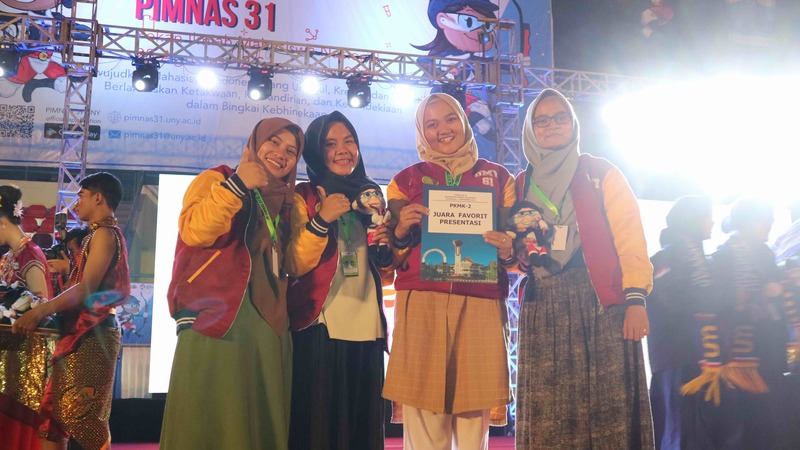 Supervised by one of English Language Education Department, Puthut Ardhianto, M.Pd., SETUAN won the Most Favourite Presentation Award in PKM-K category in Pimnas 31, held by the Ministry of Research, and Technology in Higher Education (Kemenristek-Dikti). Pimnas is one of the most prestigious scientific writing and creativity competitions in Indonesia. Held annually, the competition has five major competition categories that students can join: Program Kreativitas Mahasiswa bidang Kewirausahaan (PKM-K), Penerapan Teknologi (PKM T), Penelitian baik Eksakta (PKM-PE) maupun Sosial Humaniora (PKM PSH), Karsa Cipta (PKM KC), and Gagasan Tertulis (PKM GT). Among 14,000 entries from higher education institutions all over Indonesia, only 4,800 were funded. Then, 440 of them were selected to compete in Pimnas (Pekan Ilmiah Nasional) round based on each proposal category. SETUAN team won the judges’ vote for the Most Favourite Presentation in their presentation class through their drama performance when presenting their products. “Joining Pimnas is a valuable experience which allowed us to meet, and exchange ideas with students all over Indonesia. We also got the opportunities to witness many great inventions being presented. We are humbly grateful that SETUAN won the most favourite presentation award. These are all due to the solid teamwork and the great supervising opportunity from Pak Puthut, our supervisor. We are also thankful for the constant support that the department and the university offered,” Sayyida, the team leader said. Sri Rejeki Murtiningsih, Ph.D., the head of the department mentioned that she was proud of SETUAN team achievement. She wished SETUAN can also be an inspiration for their fellow friends and juniors in the department to make the same, if not better achievement, in the upcoming PKM competition.